Technology could reduce energy-related CO2 emissions by 64% globally. 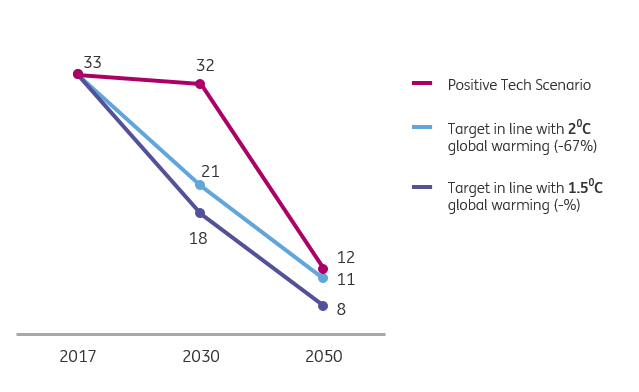 This is close to the emissions reduction targets of 2050, but the 2030 targets are missed. It will take time for new technologies to be implemented, while in the meantime the global economy continues to grow. ING has analysed technological developments in energy-intensive sectors. The report addresses technologies for energy efficiency, electrification and renewables, and presents ING’s ‘Positive Tech Scenario’. 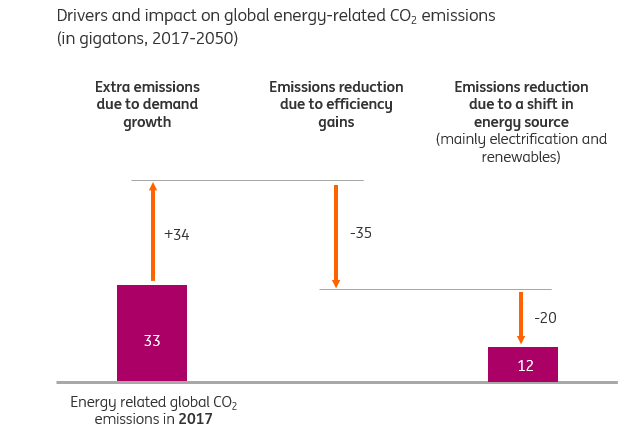 The Paris Agreement climate targets for 2030 will be missed, but technology can reduce energy-related carbon emissions from 33 gigatons to 12 by 2050 (-64%) As such, technology can deliver a low carbon economy towards that date. Many green technologies initially require government policies to become cost competitive and achieve scale. A less emphasised need for policy is to correct unintended feedback loops. For instance, while the switch to electric vehicles is expected to reduce demand for oil, this could cause the oil price to fall and spur demand from shipping and aviation. Strong policy (regulation, subsidies and most of all carbon pricing) is required to eliminate these side-effects. Policy coordination at a global level is most effective. • Innovation will trigger further electrification in the transport, real estate and industrial sectors. Power demand will increase by 160% (to 52,000 Twh from 20,000 Twh currently). • By 2050, electricity will be almost entirely generated by renewable energy, with 66% of wind and solar energy, compared to 6% today.